With 17 days left until the election, a crowd of nearly 1,800 warmed up from the freezing rain in Taylor Allderdice High School’s packed auditorium Saturday to hear Democratic presidential candidate Hillary Clinton speak. While Clinton, in her first Pittsburgh appearance since July, attacked her Republican opponent Donald Trump and gave her usual optimistic pitch, the former New York senator and secretary of state, up 5.9 points nationally and 6.2 points locally according to Real Clear Politics, also used some of her time to stump for Democratic Senate candidate Katie McGinty in her race against incumbent Republican Pat Toomey. 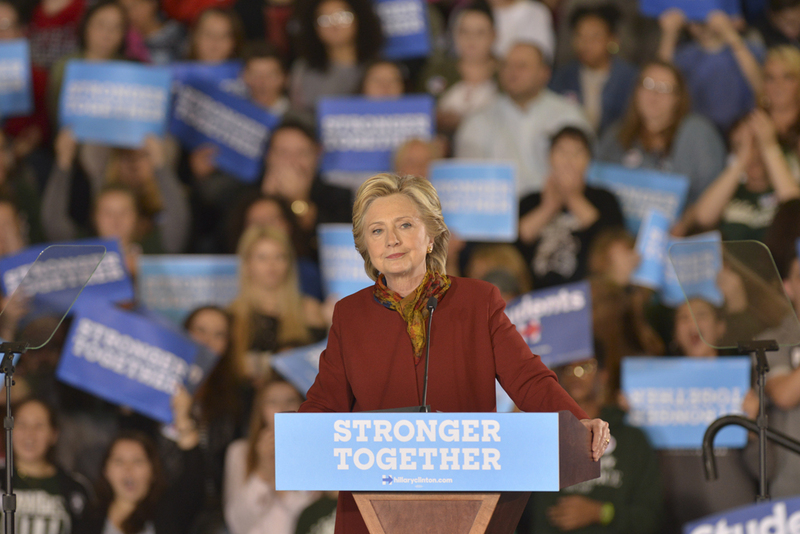 After appearing in Philadelphia earlier that day, and in her first day of campaigning since the third and final presidential debate Oct. 19, Clinton hit on issues ranging from the high cost of prescription drugs and education to middle class jobs and women’s rights. The presidential front-runner, appearing with her running mate Sen. Tim Kaine, in front of a boisterous, parka-clad crowd in Squirrel Hill, also took care to make sure the crowd realized the importance of voting in all of the races –– not just the presidential –– to achieve its goals. “We’re going to need help [making changes] after the election, so that’s why I hope you do everything you can to elect Katie McGinty,” Clinton said. During his warm-up speech, Braddock Mayor John Fetterman, McGinty’s former primary foe, repeated his endorsement of McGinty –– a former Secretary of Environmental Protection –– which he first revealed at Clinton’s last visit to Pittsburgh on July 30, at the David Lawrence Convention Center. Pennsylvania’s race is one of six elections that could most likely decide the balance of power in the Senate, alongside New Hampshire, North Carolina, Indiana, Missouri and Nevada according to the data and news site FiveThirtyEight. Most current forecasts give Clinton the edge in the national race. Reuters recently pegged her to win with 326 electoral votes — 56 more than the 270 needed to win the election — while FiveThirtyEight gives Clinton a 86 percent chance to win on Nov. 8, over Republican candidate Trump. After promoting McGinty’s “can-do attitude” and her drive to “help people make the most out of their own lives,” Clinton attacked Toomey for not publicly forsaking Trump, a line that’s been central to McGinty’s campaign in recent months. “He still refuses to stand up to Trump. A lot of Republicans have,” Clinton said. Like McGinty, Clinton took Toomey’s silence as a lack of courage, while referencing Trump’s support for the birther movement — the claim that President Barack Obama was not born in the United States — and his attack on the Khan family, whose son died in Iraq. The visit marked the sixth time a campaign event for Clinton has taken place in Pittsburgh since the Democratic National Convention in late July, including two previous stops by Kaine, as well as a visit by her husband –– former President Bill Clinton –– and her daughter Chelsea. Vice President Joe Biden will return for a seventh event, his second in Pittsburgh, in a visit to Chatham University Tuesday. Trump’s campaign, by comparison, has only appeared twice, one each by Trump and his vice presidential candidate, Indiana Gov. Mike Pence. Trump’s last visit came Sept. 22, at an ostensibly non-partisan speech at the Shale Insight Convention, a fracking industry conference. Yet, despite her confidence and sunny projections in Pennsylvania, some of Clinton’s supporters are leary of preemptively popping champagne. Rohan Suresh is one of those people. A first-year neuroscience major at Pitt, Suresh attended the event with his floormates Watole Hamda and Hilton Braithwaite, also first-year neuroscience majors. Despite the polling, Hamda thought the election would be close, the idea inspiring anxiety among Suresh and people he knows. While Clinton’s pessimistic supporters may be prepared for a loss, Trump has been stoking the fears of his own supporters who doubt the outcome of the election. Asked in the last debate if he would accept the results of the election, Trump refused, saying he’d “look at [the results] at the time,” while accusing Clinton’s campaign of committing voter fraud. Trump has also claimed, on multiple occasions, including in a speech at Gettysburg, Pennsylvania, hours before Clinton’s own speech at Allderdice High School, that the election is “rigged” against him. While the Democratic standard bearer had her own barbs for Trump, such as attacking his admission to not paying income taxes through loopholes, Clinton left her running mate to make the worst blows at the New Yorker. Kaine described Trump’s “rigging” comments as the epitome of his bombastic style. The former Virginia governor was joined in his criticism of the real estate mogul by a cross section of notable western Pennsylvania Democrats — such as Allegheny County Executive Rich Fitzgerald, Pittsburgh Mayor Bill Peduto, Rep. Mike Doyle and Fetterman. Towering over the podium, Fetterman, who has publicly called Trump a “jagoff”, posed a question during his brief speech. “Who thinks this election is going to be rigged?” Fetterman said, the audience responding with a resounding “no.” He then turned his speech to address the Republican candidate. Cheers from the crowd provided the answer. Joe Equizi, a Dormont, Pennsylvania resident at the rally who has supported Clinton “since she was the first lady,” thought that regardless of the level of rhetoric, the country could deal with the fallout of the highly contested election. “This might be the angriest [election ever], but we’ve [dealt with angry elections],” Equizi said. Paraphrasing an earlier line directed at primary challenger Bernie Sanders, Clinton empathized with the voter’s frustrations with government, saying she “wants to be their president too,” but steadfastly defended her positions.